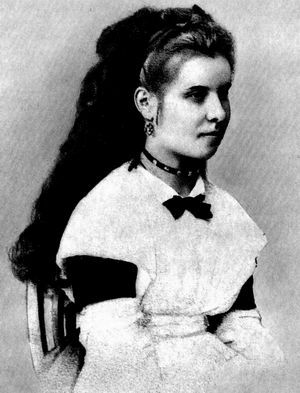 Zatyrkevych-Karpynska, Hanna [Затиркевич-Карпинська, Ганна; Zatyrkevyč-Karpyns’ka] (née Kovtunenko), b 20 February 1855 in Sribne, Pryluky county, Poltava gubernia, d 12 September 1921 in Romny, Sumy county, Kharkiv gubernia. (Photo: Hanna Zatyrkevych-Karpynska.) Theater actress. She made her professional debut in Marko Kropyvnytsky's troupe in 1883. 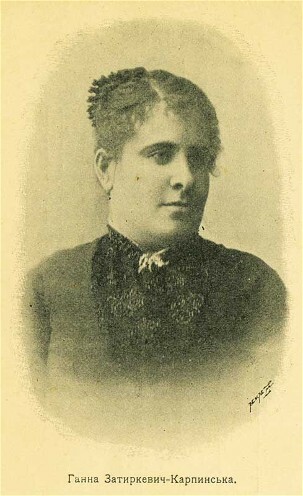 She worked in Mykhailo Starytsky's (1883–5), Kropyvnytsky's (1885–92 and 1896–8), and Mykola Sadovsky's (1892–6) troupes, as well as in (from 1904) those of Dmytro Haidamaka, Onysym Suslov, and Oleksii Sukhodolsky; then in Sadovsky's Theater (1917–18) and the State People's Theater (1918–19); and, during her last year, in Oleksander Korolchuk's troupe. An actress of great insight and simplicity, she performed in over 100 roles, the best of which were from the populist-ethnographic drama repertoire. Among them were Ahrafena in Hryhorii Kvitka-Osnovianenko's Shel’menko-denshchyk (Shelmenko the Orderly), Stekha in Taras Shevchenko's Nazar Stodolia, and Hapka and Ryndychka in Kropyvnytsky's Zaidyholova (The Dreamer) and Po reviziï (After the Inspection). In the non-Ukrainian repertoire she successfully played the character roles of Poshlepkina in Nikolai Gogol's Revizor (The Inspector General) and Dulska in Gabriela Zapolska's Moralność pani Dulskiej (Madame Dulska's Moral Code). Biographies of Zatyrkevych-Karpynska were published in Kyiv in 1956 and 1966.